Posted by aconsciousappetite in All Fowl, Food, I Seafood, Oink Oink, Restaurants, Where's The Beef? When I decided to start chronicling my eats through this blog, Su Hong was on my list of restaurants to cover and this is probably going to be the first post of many. Why, do you ask? Because Su Hong Eatery is my family’s home-away-from-home restaurant. We eat here frequently and the King’s (proprietors) are wonderfully hospitable to us. But, the outstanding reason we eat here so often is because the food is spot-on authentic, consistently fantastic and the variety is mind-blogging. 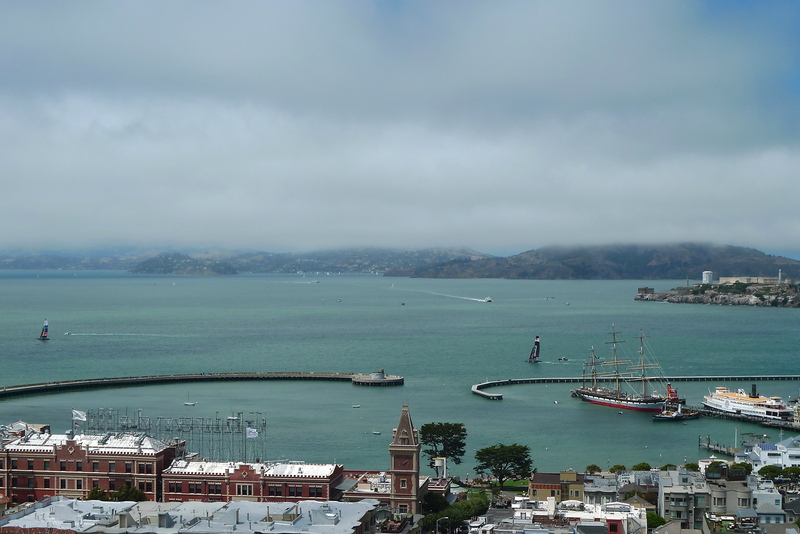 It is pure luck that it is near to where my parents live in Palo Alto. On this day, my parents, bf and I were dining and it was lunchtime. Per usual, we ordered enough food for several more “invisible” people. 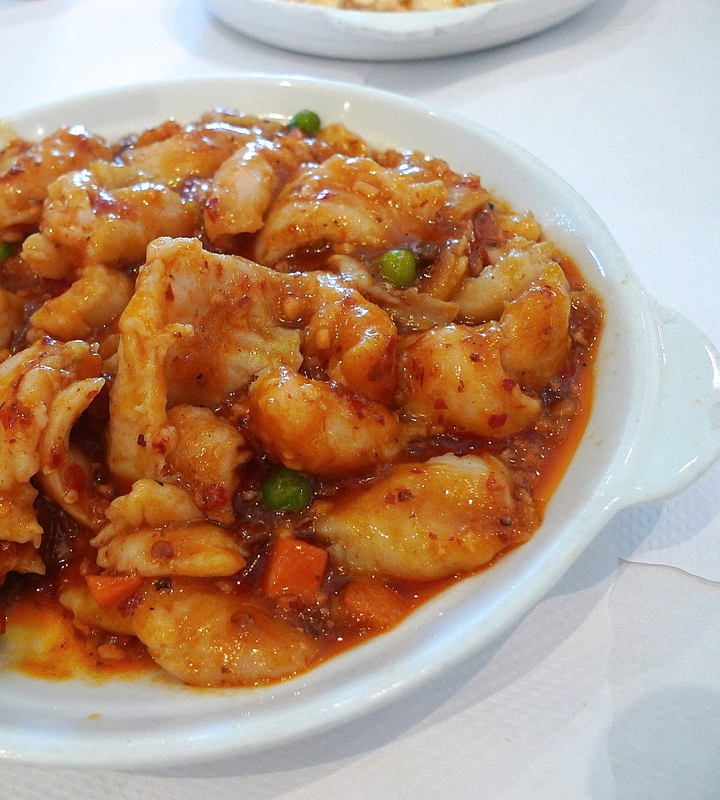 I love spicy foods, so this is one of my favorites, Fish Fillet in Hot Bean Sauce. The fish is tender and I smother my white rice with this delicious spicy sauce. 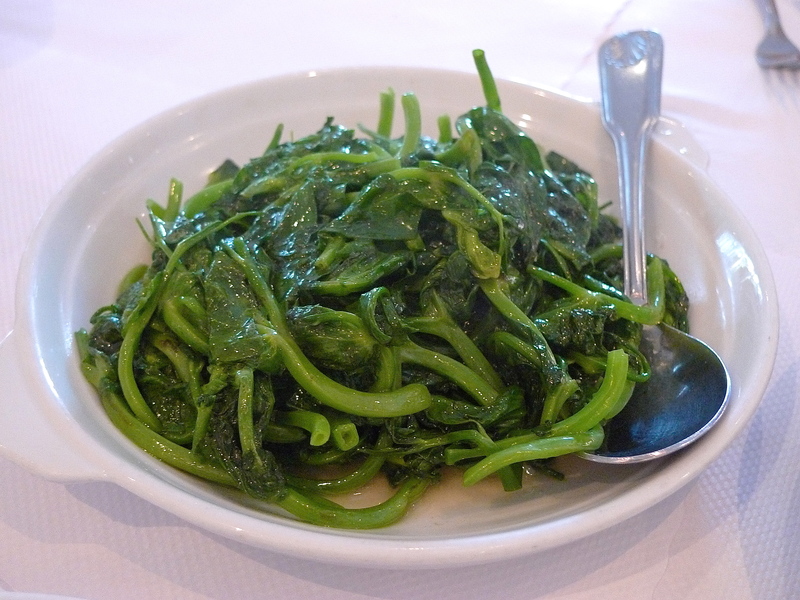 This is the Sautéed Chinese Pea Shoots. It’s a very particular vegetable that I’ve only seen used in chinese cooking stir-fried in oil with garlic. Cooked correctly, it is juicy and has a nice crisp bite to it. 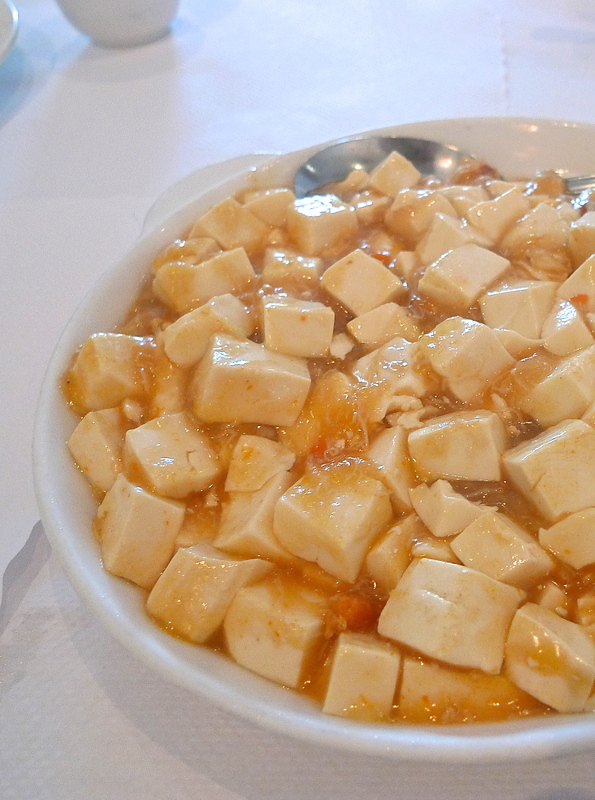 Beancurd with Crab. Mmm, I also love tofu – soft, firm, doesn’t matter. Here, it is in this richly flavored, yet light crab sauce. So good. We ordered this especially for bf because he loves his Mongolian Beef. 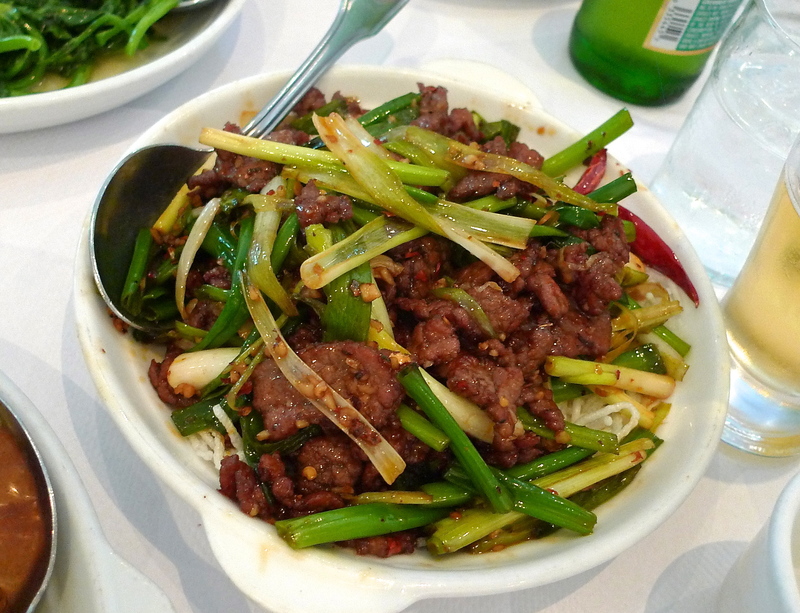 As far as mongolian beef goes, this is heads above all others I’ve ever tried. Su Hong’s dishes are cooked to perfection, not laden with oils and they use quality ingredients. 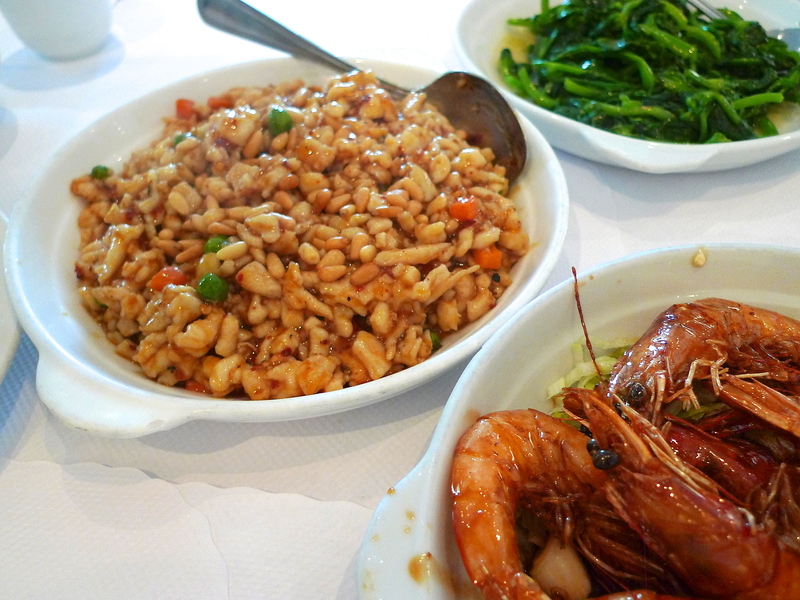 Peeking on the lower right corner is the Braised Whole Prawns in Shell, and the other dish is Pine Nut Chicken in Hot Garlic Sauce. This chicken dish is incredible. Using pine nuts is a unique twist. The peas and carrots stir-fried in the spicy garlic sauce with the diced chicken is out of this world. I mixed this pine nut chicken with some noodles the next day and it was even better the second time around. Hurray for left-overs! I used all of the names of the dishes as you would find on their English menu. If you’re ever in the area, this restaurant should not be missed. As I mentioned before, their repertoire is long, so you’ll be seeing more meals from Su Hong.